Did you name your bass(es)? I decided my basses should have names. 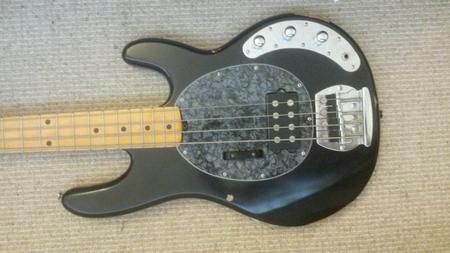 The oldest, the BEAD tuned Ibanez has the right to be called ThunderBass. The blueburst G&L will be Big Blue from now on; big for the tone, blue because of the colour. I'm still in doubt about the white P Bass I recently bought. It'll be White Punk or Rebel. I just dunno yet. I had a white Squire P-bass once. It was metalic pearl white. I called it me “Pearl bass”. I never named my G&L. My 6-string neck-through mahogany bass is affectionately called, “boat anchor”. And my custom 5-string blue fretless that Marko helped me make has been named, “Blue Angel” by my daughter. You're lucky to own Fenders. What if they would have been Ibanezes? Hey Marko - how do you like the thumb rest? I added one on my Project Bass (that's its name, for now, and included to be on topic) and I haven't gotten used to it yet. Mine's a Fender named Dennis, after a friend of mine who has a booming baritone voice! No, I don't name my basses. I can't remember Marko's name, address, and phone. I wouldn't be able to remember them if I named my basses. 2nick3, yeah the thumb rest works fine for me, better than using the E string or the pick up. Thanks Marko. Sorry 'bout that.